Red-rimmed eyes marked the send-off on Tuesday (Nov 13) morning for late Chinese gongfu novelist Louis Cha Leung Yung, better known by his pen name Jin Yong. Cha, one of the most prolific writers who counts former Chinese leader Deng Xiaoping among his fans, died at the age of 94 on Oct 30 at the Hong Kong Sanatorium and Hospital surrounded by his family. 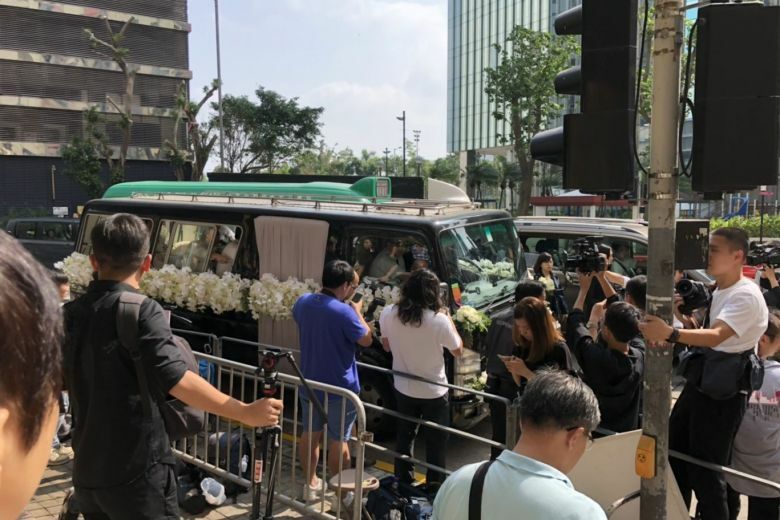 Family members and close friends, including famous food critic Chua Lam and acclaimed director Ann Hui, were present at the Hong Kong Funeral Parlour in North Point. The hearse headed to Lantau island's Po Lin Monastery, where the body will be cremated. Cha, a newsman and novelist, was born in 1924 in the eastern Chinese province of Zhejiang and moved to Hong Kong in 1948. He set up the Hong Kong paper, Ming Pao Daily News, in 1959. Together with Axe Brand Universal Oil founder Leung Yun Chee, he also set up Shin Min Daily News, which was first published in Singapore on March 18, 1967. Cha's first novel, written in 1955, was an instant hit with readers, who were drawn to his works because of the colourful characters and values of courage, integrity and honour highlighted in the stories. The renowned writer went on to pen 14 more swashbuckling gongfu fantasies (15 in total) before putting his pen down in 1972 with The Deer And The Cauldron. His most popular trilogy was The Legend Of The Condor Heroes. Views are divided when it comes to the literary value of these works, even though they are very popular - more than 300 million copies have been sold globally. His works have also been widely adapted into television series, movies, comics and even video games. Famed Chinese martial arts novelist Jin Yong has died at the age of 94 after a long illness, Hong Kong media reported on Tuesday (Oct 30). Jin Yong's last novel and savage comic masterpiece subverts most of his preceding martial arts fantasies. Its anti-hero, Wei Xiaobao, lives in a realistic, chaotic Qing China, where he stumbles into alliances with various groups - anti-Qing rebels, the Qing court, a cult - but does not buy into any of the causes. A great saga that has just about everything: a trio of heroes including a lovesick monk with a birth secret; a far-reaching, blood-soaked conspiracy; a tragic romance and, out of nowhere, a lovely chapter overflowing with horticulture, poetry and the sweet pain of infatuation. Above: A 2003 TV adaptation starring Jimmy Lin, Liu Yifei and Singapore actress Fann Wong. Fann Wong in the series. Possibly the most loved of Jin Yong's novels. It is a classic you should read - or pretend to have read - so you can voice educated opinions about, say, the intelligence gap between the simple hero, Guo Jing, and his sophisticated love, Huang Rong; the murder mystery on Peach Blossom Island; or which of the Five Greats of the pugilistic world is the greatest. Above: TVB's 1983 rendition of The Legend of The Condor Heroes, starring Felix Wong and Barbara Yung. Andy Lau as Yang Guo and Idy Chan as Xiaolongnu in the 1983 Hong Kong version of The Return Of The Condor Heroes, based on the novel by Jin Yong. Tay Ping Hui (third from left) as Genghis Khan in the 2016 Chinese television series adaptation of Legend Of The Condor Heroes. Zhou Xun as Huang Rong and Li Yapeng as Guo Jing in the 2003 Chinese television series adaptation of Jin Yong's novel Legend Of The Condor Heroes. Hunan Television's 2013 production of The Legendary Swordsman titled Swordsman, features Chen Xiao (left) and Yang Rong. The 1983 version of The Legend of the Condor Heroes starring by Felix Wong and Barbara Yung is considered by many to be a classic television adaptation of the novel. Guo Jing is the fictional protagonist of the martial arts novel The Legend of the Condor Heroes by Jin Yong. He is described as "dumb", slow to learn and inarticulate, but his most outstanding trait is his constant strife for moral rectitude, which helps him become the top-class kung fu master. Huang Rong is the leading female character in The Legend of the Condor Heroes. Beautiful and smart, she is a master of kung fu and helps her lover Guo Jing overcome many difficulties. Hong Kong actress Carman Lee stars Xiaolongnyu, the female lead of the TV drama The Return of the Condor Heroes (1995 version). Hong Kong actor Louis Koo and actress Carman Lee star the TV drama The Return of the Condor Heroes (1995 version). Chinese actress Liu Yifei stars Xiaolongnyu, the female lead of the TV drama The Return of the Condor Heroes (2006 version). Chinese actor Huang Xiaoming and actress Liu Yifei star the TV drama The Return of the Condor Heroes (2006 version). A still from the classic TV drama The Demi-Gods and Semi-Devils (1997 version). Hong Kong actor Felix Wong plays the role of Qiao Feng in the TV drama The Demi-Gods and Semi-Devils (1997 version). Hong Kong actor Ho-Man Chan and actress Carman Lee star the TV drama The Demi-Gods and Semi-Devils (1997 version). Hong Kong top actress Brigitte Lin Ching-hsia stars as Dongfang Bubai in the 1992 film Swordsman 2. Hong Kong top actress Brigitte Lin stars as Dongfang Bubai in the 1992 film Swordsman 2. Chinese actor Li Yapeng stars as Ling Huchong in the 2001 TV drama Swordsman. Chinese actor Li Yapeng and actress Xu Qing star in the 2001 TV drama Swordsman. Hong Kong top actor Jet Li and actress Michelle Reis star in the 1992 film Swordsman 2. Hong Kong top actress Joey Wong stars in the 1994 film Swordsman 3. Actor Alec Su and actress Gao Yuanyuan star in the TV drama The Heaven Sword and Dragon Saber (2003 version). Actress Alyssa Chia stars as Zhao Min in the TV drama The Heaven Sword and Dragon Saber (2003 version). Hong Kong actress Sharla Cheung stars as Zhao Min in the 1993 film Kung Fu Cult Master. Hong Kong actor Chiu Man-cheuk stars in the TV drama The Book and the Sword (2002 version). Hong Kong actor Jordan Chan stars in the TV drama The Deer and the Cauldron (1998 version). Louis Cha (left) at the office of China Daily Hong Kong Edition in March 2005.